Monday May 20th 1889 I was very busy all forenoon cleaning up the house and doing some baking. I wrote a little to mother. I went to town and attended to some errands and the down to Hatties to spend the afternoon where I had a pleasant time. Will came to supper and we all went to the theater. Gardner played "The Fatherland" we enjoyed it very much. Tuesday May 21st 1889 It was a nice day. We washed some and I done a lot of work out of doors in the afternoon. I put out some of the plants. Bird came over to stay all night here. 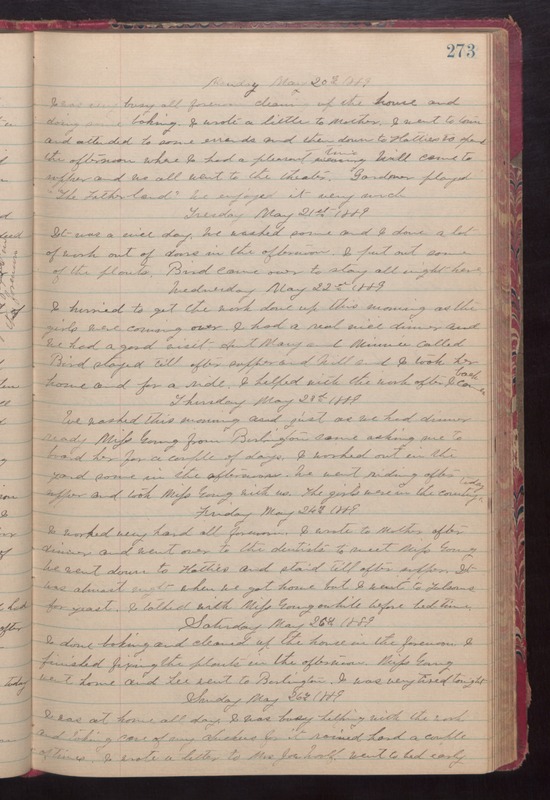 Wednesday May 22nd 1889 I hurried to get the work done up this morning as the girls were coming over. I had a real nice dinner and we had a good visit. Aunt Mary and Minnie called Bird stayed till after supper and Will and I took her home and for a ride. I helped with the work after I came back. Thursday May 23rd 1889 We washed this morning and just as we had a dinner ready Miss Young from Burlington came asking me to board her for a couple of days. I worked out in the yard some in the afternoon. We went riding after supper and took Miss Young with us. The girls were in the country today. Friday May 24th 1889 I worked very hard all forenoon. I wrote to Mother after dinner ansd went over to the dentists to meet Miss Young. We went down to Hatties and staid till after supper. It was almost night when we got home but I went to Folsoms for yeast. I talked with Miss Young awhile before bed time. Saturday May 26th 1889 I done baking and cleaned up the house in the forenoon. I finished fixing the plants in the afternoon. Miss Young went home and Lee went to Burlington. I was very tired tonight. Sunday May 26th 1889 I was at home all day. I was busy helping with the work and taking care of my chickens for it rained hard a couple of times. I wrote a letter to Mrs Joe Woolf. went to bed early.